Today, the online retailer for wine enthusiasts (with the killer domain name) Wine.com is finally launching a mobile site at m.wine.com. Like its desktop-sized counterpart, the new site allows customers full access to Wine.com’s inventory of wine, gifts and accessories, site search with filtering, product details, account management, and of course, the ability to make purchases from your mobile device. The mobile site is also able to identify your location automatically so it knows which wines are available for shipping to your region. And after you’ve placed an order, you can track your packages via the new site, too. Alongside the launch, the retailer also announced several milestones, including the fact that it now has over 1 million registered users. 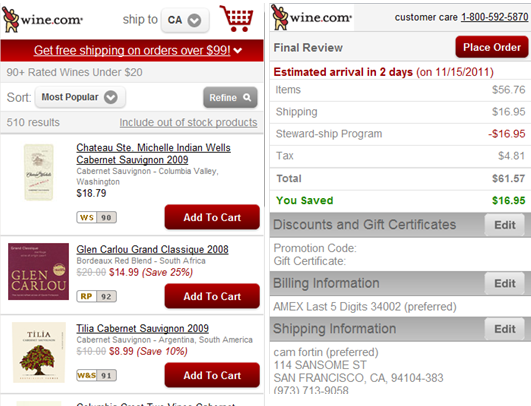 Wine.com says it ships over 2 million bottles of win per year, representing 35% growth over last year. As for the size of its inventory, there are over 13,000 different bottles which can be shipped to 90% of the U.S. population, despite the complicated laws around shipping alcohol. The need to go mobile was pressing, as Wine.com reported that over 7% of its unique traffic came from iPhones alone (out of 8% smartphone traffic). And this is despite the fact that Wine.com has both iPhone and iPad apps available in iTunes. That’s something other online retailers should take note of: apps are not enough. If your customers are used to visiting your website on the Web, many continue to do so, even if your cool iOS app offers added functionality (as Wine.com’s does, what with the geo wineries feature and wine cave, etc.). Also interesting: 6% of Wine.com’s overall traffic came from the iPad, but 8% of its revenue came from the iPad. That means either iPad owners buy more wine or the iPad experience is just really great and conductive to shopping. Meanwhile, only 1% of the revenue came from the iPhone, and the iPad average order value is 50% higher than on the website. The company says that should change now that there’s a new mobile website. One would hope. It’s somewhat remarkable to see major retailers that have built mobile applications in advance of a functional mobile website, as Wine.com has. Look, I love a good app as much as the next guy, but really, the app everyone uses the most is still the browser. Thank goodness Wine.com finally figured that out.